It has been a very cold start to the New Year! Our area has been under Wind Chill Advisories and dealing with sub zero temperatures. Too much winter for me! I'm hibernating with my coffee, blanket and books. ​I adore books. 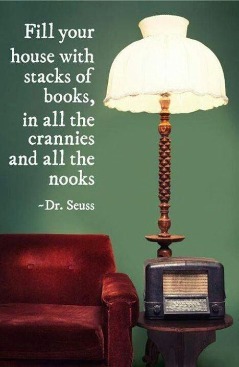 I usually have a book near my chair, on the table, in my car or purse...you get the idea. My husband and I are both book people! I think this image describes our house fairly well. However, I'm a chronic migraine girl. So reading and concentrating on the little text floating in front of me is often really difficult. Last year, I only read three books. Ugg, that makes my heart cringe. But it doesn't stop me from surrounding myself with them or skimming a few pages when I'm able. New Year. New Goals. New Stack of Books! For 2018, I am determined to get my book reading back on track. For a self described bookworm, three books in one year is just not enough knowledge and imagination to fill my cup. What is on my stack of books to start the year? Let's take a look! Called to Create by Jordan Raynor- Due to the above mentioned deep freeze in weather, I was able to start and finish this already! I loved it. Such an inspiriting way to start the year. Jordan talks about the value of our work and our call as creatives to use the gifts we've been given for the glory of God. Boundaries by Henry Cloud- this will be a re-read for me. But I joined an online book club to go through it again. It's a valuable book and well worth a second go around. American Fire by Monica Hesse- I've started this and I'm so anxious to really dive into it. It's a nonfiction, journalistic book on a Bonnie and Clyde type couple who were convicted of widespread arson. Messy Journey by Lori Wildenberg- This book is for parents of prodigals. It came out last year and after seeing it recommended so much- it's on my stack now! Curtain by Agatha Christie- I started this last year and haven't finished it yet. I'm slowly making my way through because I love Agatha Christie but I do know this story. I pick the book up when I'm in between others. Whispers of Rest by Bonnie Gray- A devotional book I started last year. It's only 40 days long but I haven't finished yet. Wait! Listen to the why! I haven't it so good, like therapy in a book, that I keep going backwards and re-reading. Will finish this year. As you can see, I often have a couple books going at one time. I'm excited about my stack this year! What are you reading?